seasons as well, but did not place in the top three for league or provincial play. Below is a team shot of the Loma Women's team (now starting to gear up for New Zealand Worlds in April 2017). Woman’s Fastball within our Club has existed since the early 1970's and has been very successful in developing a high level of play in both Local and Provincial league for our Senior Teams. 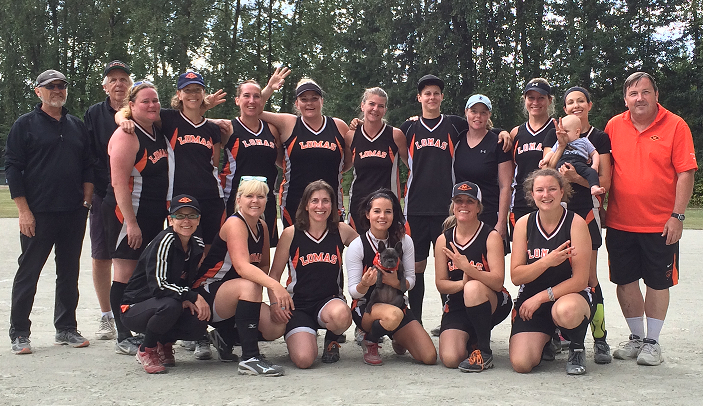 The Meraloma Women's Fastpitch section is currently sporting two teams. New players (19 years and older) are always welcome. With two teams in two separate leagues and divisions there’s sure to be a spot for everyone! The Lomas play out of the VWFL league and are a highly competitive group. The Diamond M’s are currently playing out of the VWRSL league. While still having a competitive edge, this team is more focused on getting players back into the game and developing their skills to the next level. This team has been in the league since 2000 and is coached by George Hrennikoff and Glen Robinson. The Lomas team has had many successes over the years and continue to be a force to be reckoned with. The team is currently recruiting new players for the upcoming season. They are also gearing up for the Worlds in New Zealand in 2017 competing in the over 35 category hoping to bring home a gold medal to the club. Our Meraloma Masters over the years have been highly successful in Provincial, Western Canadian & World Masters Championships. We also take teams to the World Masters (Over 45) each year wherever they are being held. Contact us if you are interested in joining one of these tours. Younger Diamond M Players – 2004 Provincial Bronze, 2005 Provincial Bronze Masters (45 years +) - 2005 World Masters Games – Gold Medalists, 2011 Senior D Provincial Silver Medal. There is a long and rich history of men’s fastpitch at Connaught Park and within the Meraloma Club. Open tryouts are available at any time as these teams have a plethora of former baseball players filling out their rosters. The Premier men’s fastpitch team competes locally in the 16 team Lower Mainland Fastpitch League featuring teams from Vancouver, Richmond, Surrey, Burnaby and Squamish. The team is coached and managed by players Derek Mayson and Daniel Lee while Dean Valli of the BC Lions offers assistance in the 3rd base coaching box when he isn’t busy winning Grey Cups. This is one of the most active travelling teams in any sport at the club as it makes annual trips throughout the province and down to California for tournament play. Locally, the team has won league playoff championships in 2002, 2007, 2009 and 2010 within the past decade. Over the years, the Premier men’s team has also developed numerous Canadian National Team members including Derek and Brian Mayson, Kevin Schellenberg and Calem Gardner. It has also welcomed many overseas players in recent history including players from New Zealand, Australia and the Dominican Republic. The goals of the team include continued success in the local league and tournament play, development and promotion of the sport and maintaining a strong nucleus of players that has fun competing together. The Meraloma Men’s Fastpitch team is a highly competitive group that competes in the Connaught Park Fastpitch League and maintains an interlocking schedule with the Lower Mainland Fastpitch League featuring teams from Vancouver, Richmond, Surrey and Burnaby. The team is coached and managed by Lance Finskars ([email protected]) who created the team around a strong core of veterans augmented by a constant flow of young talented players. This locally active team plays a (24) game schedule complemented by (4) tournaments and attendance at the Provincial championships. Since 2006 this team has developed from a few core players to a team that has made the championship game every year since 2010, with wins in 2010 and 2012. This team strives for sustained success in league and tournament play, development of players, promotion of the sport, and camaraderie and good times for all. Our season runs May through July with pre-season training beginning in March, and we are currently recruiting new players for the upcoming season. Former baseball players as well as orthodox softball players are welcome.